One car per week from Bingham to Long Branch actually operated for a very short time in 1966 (Feb 26 to May 21), when QUEEN was split at the east end to operate evening and weekend cars alternately to Neville and Bingham. 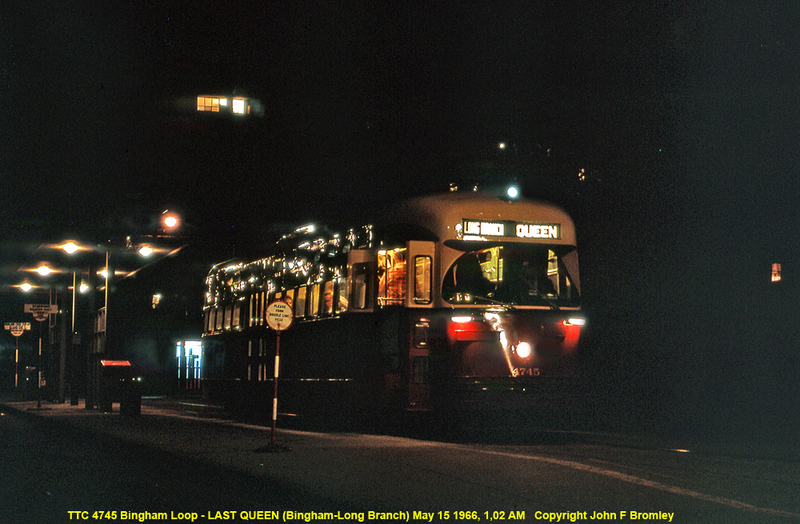 The last QUEEN of the day from Bingham, before the 22A COXWELL night bus took over on Kingston Rd) made that trek. 4745 made the last Bingham-Long Branch run at 1.02 AM on May 15. The car was 1 minute late arriving at Bingham and my planned 8 second exposure was cut to just over a second as the doors slammed open and shut and he took off.